Welcome to the twentieth installment of the Haunted Montreal Blog! Released on the 13th of every month, the December 2016 edition focuses on research we are carrying out into the Protestant Mount Royal Cemetery and its numerous ghosts. With the cold winter setting in, Haunted Montreal is not offering any more public tours until May, 2017. Stay tuned for some of the ideas we are planning for the winter months! 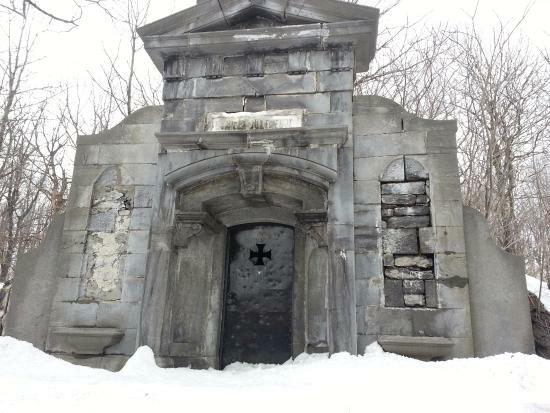 Located high up on the slopes of Mount Royal, the Protestant Mount Royal Cemetery is rumoured to be one of the most haunted places in Montreal. Often described as a City of the Dead overlooking a City of the Living, it is reportedly home to many ghosts, fairies and other mysterious apparitions. Haunted Montreal recently received an anonymous letter from a former Westmount High School student who had a terrifying experience in the graveyard. The letter-writer claims that a spirit followed him or her home following a visit to the cemetery. After going to sleep, the author was woken up by a ghostly male figure who was quietly uttering his or her name. Drenched in sweat from fear, the letter-writer found the strength to flick on the light switch, only to realize there was nobody present. 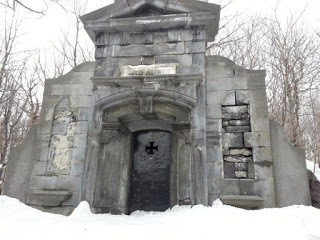 In telling Haunted Montreal his or her story, the author joins a long list of others who have experienced ghostly and paranormal activity in the Protestant Mount Royal Cemetery. 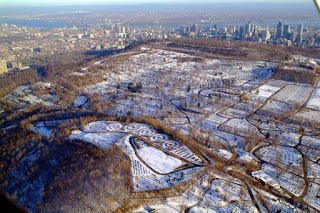 The 165-acre Mount Royal Cemetery was incorporated in 1847 after the Protestant St. Lawrence Burial Ground was deemed full and could no longer accept any new corpses. 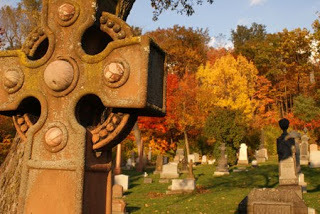 Opened in 1852, the Mount Royal Cemetery was one of the first cemeteries in North America to follow a European trend whereby burial grounds were moved outside of city limits and landscaped into beautiful gardens, ensuring the dead could rest in peace. Administered by 21 elected Trustees, the cemetery is a private non-profit organization and, while originally designed for burials of six Protestant denominations, is now open to persons of all faiths and races. Among the lush gardens, majestic monuments, obelisks and statues have been erected over the years, creating an exceptional funerary setting. 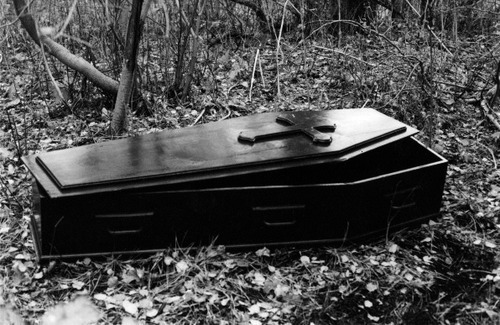 Burial rights have always been offered in perpetuity and the Cemetery Managers ensure that no graves are ever reused or abandoned, making it a very popular place to spend an eternity. Due to its exceptional history and beauty, the Mount Royal Cemetery was designated a National Historic Site in 2002. Today, there are almost 200,000 bodies interred in the cemetery, which is slowly running out of space. 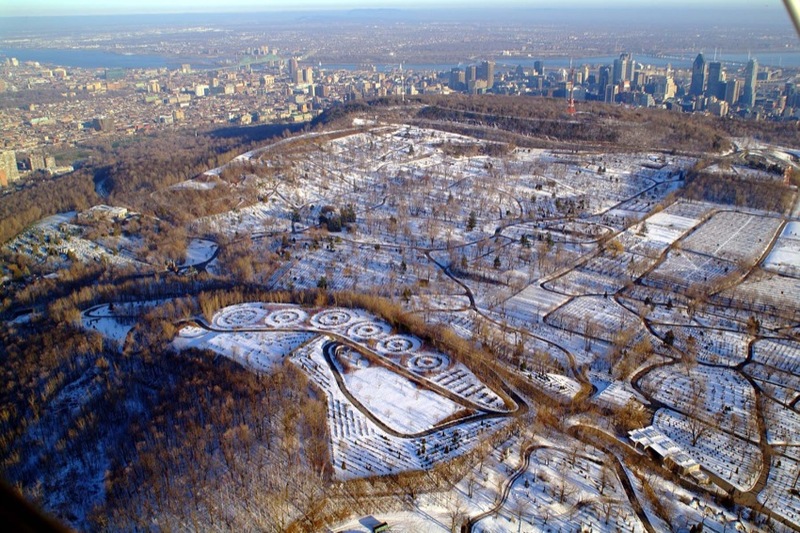 Statistically, Mount Royal Cemetery is part of the largest intact burial ground in North America when combined with the neighboring Catholic Notre-Dame des Neiges Cemetery and two smaller adjacent Jewish burial grounds. These include the Spanish and Portuguese – Shearith Israel Cemetery and Shaar Hashomayim Cemetery. 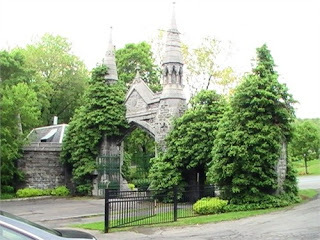 Of the four graveyards, the Mount Royal Cemetery is said to be the most haunted. Legend has it that just after sunset shadowy figures begin roaming the graveyard and lingering on its bluffs. 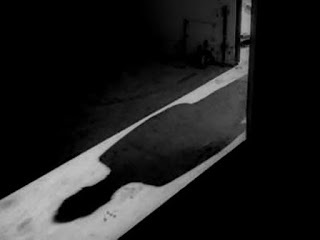 Strange, undead entities have been seen wandering through the cemetery and at night there are reports of paranormal shadows flickering about. 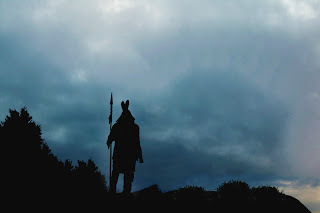 The most famous ghost of the Mount Royal Cemetery is said to be an Algonquin warrior who has been seen near the cliffs overlooking the Camillien Houde Lookout, often terrifying tourists below. It should also be noted that the cemetery closes at 5 pm during the colder months and that security guards patrol the entire graveyard at night in cars. One of the reasons for that, aside from the usual vandals, are rumours that black masses sometimes occur in the cemetery, allegedly involving the sacrifice of animals. This could be another reason why Mount Royal Cemetery is rumoured to be so haunted. The author also mentioned a male friend who “has witnessed EXTREMELY strange and unexplainable things” in the cemetery, including a mysterious cult of some sort with “a circle of candles possibly floating” nearby. The friend was also startled when “a massive white dog or wolf appeared and started running towards him.” Terrified, he ran away as fast as he could and, once at a safe distance, counted his blessings that he was unharmed. With their creepy encounters, the anonymous author and his or her friend joined a long list of people who have experienced the paranormal in the Mount Royal Cemetery. There is no easy answer to the question as to who or what is haunting this hallowed ground.With almost 200,000 bodies, including many people and children who died under tragic circumstances, there are a lot of possibilities. Indeed, the first corpse to be buried, on October 19th 1852, was that of a holy man named Reverend Squire who had perished during the course of his duties. 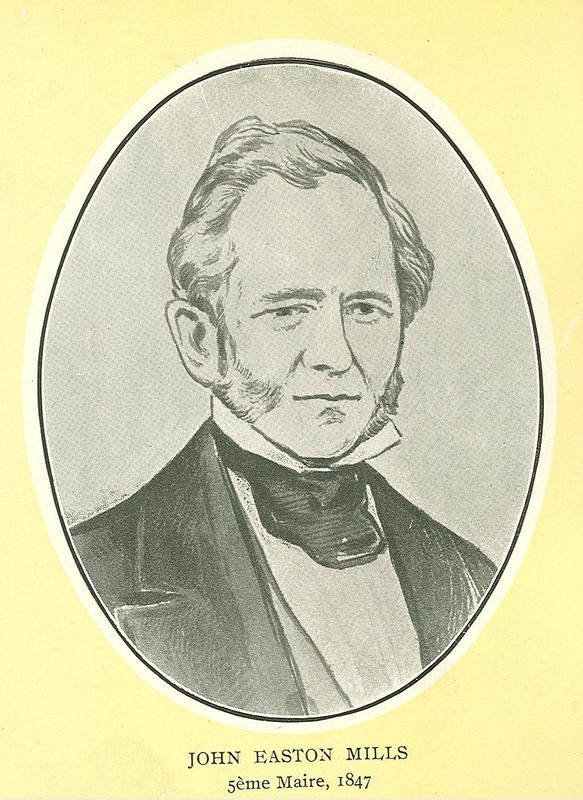 Four days earlier he was asked to go to the Ottawa Hotel to visit a sick merchant who was dying of cholera. 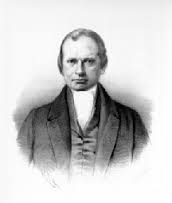 The next day, Reverend Squire himself fell ill and then perished soon after. His burial would mark the beginning of long series of funerals that is still going on to this very day. The cemetery also contains a section for children who died prematurely, often due to contagious diseases, as well as 459 war graves. Many of these military personnel, 276 from World War I and 183 from World War II, were killed violently in battle. 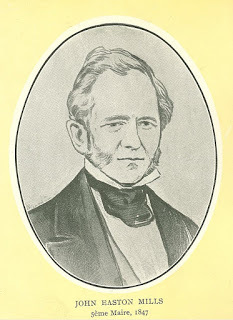 Notable politicians who died tragically include Montreal Mayor John Easton Mills, who succumbed to typhus in 1847 while caring for Irish Famine refugees, and Canadian Prime Minister Sir John Abbott, who was cut down by brain cancer in 1892. 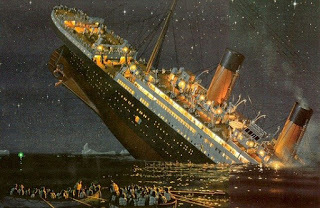 There are many others who met tragic fates, including some of the victims of the Titanic’s sinking. Charles Melville Hays, once the President of the Grand Trunk Railway, drowned at sea when the great ship sank after striking an iceberg in 1912. Many hours after the tragedy, his body was found floating in the ocean by a rescue boat and was identified by a gold watch with his name engraved on it. Charles Melville Hays’s corpse was transported to Montreal on a train from Halifax and he was buried in the Mount Royal Cemetery on May 8th 1912, almost a month after the tragedy. Five more Titanic victims are buried in Mount Royal Cemetery, and there are also five in the Notre-Dame-des-Neiges Cemetery, and one in the Baron de Hirsch Cemetery. There is also a commemorative plaque, installed at the Montreal Sailors’ Institute Lot, where more than 550 sailors have been buried since 1890, many of them from drowning. The list of tragic deaths goes on and on. As for the ghostly Algonquian warrior, there are many questions as to why he haunts the cemetery. Is he guarding something? Did he perish long ago in a forgotten war? Is his presence related to other First Nations burial sites found on Mount Royal? Historically, there have been discoveries of aboriginal graves on the mountain, often with the deceased being buried in the fetal position. Could the Protestant Cemetery have been laid out on top of another older burial site, creating a disturbance for those originally interred? If so, could the spirit of the Algonquian warrior have returned to this world in a sort of paranormal protest? While nobody knows the answers to these questions, the appearance of the ghostly Algonquian warrior is definitely one of Mount Royal’s most mysterious legends. With so many possibilities among the almost 200,000 burials, it is almost impossible to determine just who or what is haunting Mount Royal Cemetery. With all the shadowy figures, strange cults, ghosts and fairies, only one thing is certain: Mount Royal Cemetery is one of the most haunted places on the island of Montreal. It’s a true City of the Dead overlooking a City of the Living. A big thank you to all of our clients who attended a Haunted Montreal ghost walk during the 2016 season! If you enjoyed the experience, we encourage you to write a review on our Tripadvisor page, something that helps Haunted Montreal to market its tours. Lastly, to receive the blog on the 13th of every month, please sign up to our mailing list. Westmount’s Murray Hill Park is a 14 acre, bucolic greenspace that has long attracted residents to enjoy picnics and games on its grassy slopes. The recently deceased Montreal bard Leonard Cohen grew up beside these grounds and left readers with haunting descriptions of it in his novels. 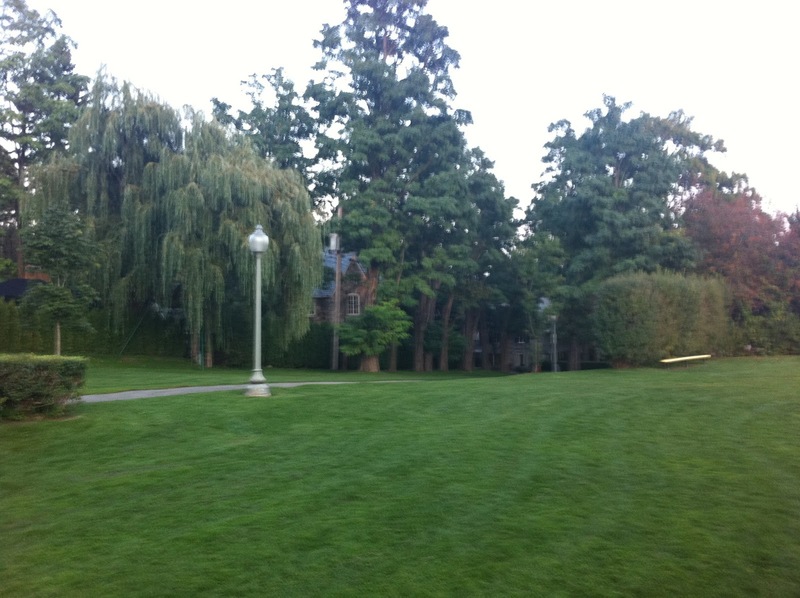 There are also rumours that Murray Hill Park is haunted by ghosts from an older era. More specifically, there are unsubstantiated reports that a host of phantom children in antique under-things can sometimes be seen singing while traipsing through the large, open greenspace. If true, who are these ghostly children and why do they haunt Murray Hill Park? Interesting histories of Montreal’s cemetery. I had written a fiction some years ago that begins with a Montreal cemetary ghostly encounter. My first attempt at fiction . “The Girl From Midnight”.